Looping has become a popular performance technique, opening new worlds of creativity for thousands of musicians in dozens of different contexts. The Roland RC-505 takes looping to a high art. The RC-505 is a unique and powerful live performance tool that's perfect for next-generation loop artists. 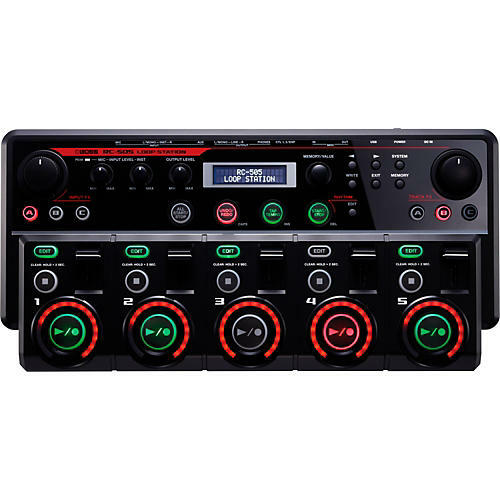 In a compact tabletop device, you have easy fingertip control of five stereo phrase tracks and various loop playback behaviors, plus INPUT FX and TRACK FX that deliver a wide range of real-time processing options for dynamic, expressive sound creation. Just plug in a mic, instrument, or other audio source, and then ride the intuitive panel controls to build and mix some amazing loops! The RC-505 also supports computer integration via USB and operation with external pedals and MIDI, opening a world of advanced looping possibilities for all types of musicians. The RC-505 is outfitted with a number of simultaneous inputs, allowing you to capture and mix a variety of different audio sources as you build loops. There's an XLR microphone jack with phantom power, mono/stereo º-inch inputs for guitars, synths, or other instruments, and an AUX mini-jack for connecting a music player, smart phone, or other stereo device. Via USB, you can plug into your computer and import/export WAV audio phrases, great for loop archiving or loading up RC-505 phrases with backing tracks or sounds for sampler-style triggering. The RC-505 also functions as a USB audio/MIDI interface, making it simple to integrate with your favorite DAW software for audio recording, MIDI sync, and more. With the RC-505, you have the ability to set up customized real-time controls for the way you like to loop. You can specify up to eight different functions and operate them in a variety of ways-with front-panel controls, an external expression pedal or foot switches, and/or various MIDI Control Change messages-extending your command of looping and many other operations. The eight control assignments are stored with phrase memories, allowing you to create and recall custom setups for different songs and performing situations.